The objective of this visit was for Helping Hands Bring Sunshine (HHBS) to provide blood sugar and blood pressure screening to the residents of Croix-des-Bouquets, and to conduct hand to hand distribution of toiletries, school supplies, clothing and food kits to the students and residents of the community. The team arrived in Port-Au-Prince, Haiti and immediately met with the local director of logistics and coordination, Evans Paul and the other local team members of HHBS. The team assembled at the Karibe Hotel, and was briefed by Fran Juste. The itinerary, goals, prospective challenges, and role specialization of the mission were discussed. The team sorted and organized the items for distribution, and the health screening. The team arrived in Croix-des-bouquets, and were warmly welcomed by the students, parents, and residents of the community. The team was introduced to the community, followed by the commencement of the health screening. Our clinical ambassadors screened approximately 150 community members. While the health screening was taking place, our HHBS ambassadors distributed kits containing hygienic products, topical ointments, and other donated items to the community members. Day One of the community engagement and distribution was a success, and culminated with an HHBS sponsored hot meal for the community members. The team conducted a detail sort of the items in terms of recipients’ size, age and gender, and they were packaged individually for easy distribution. 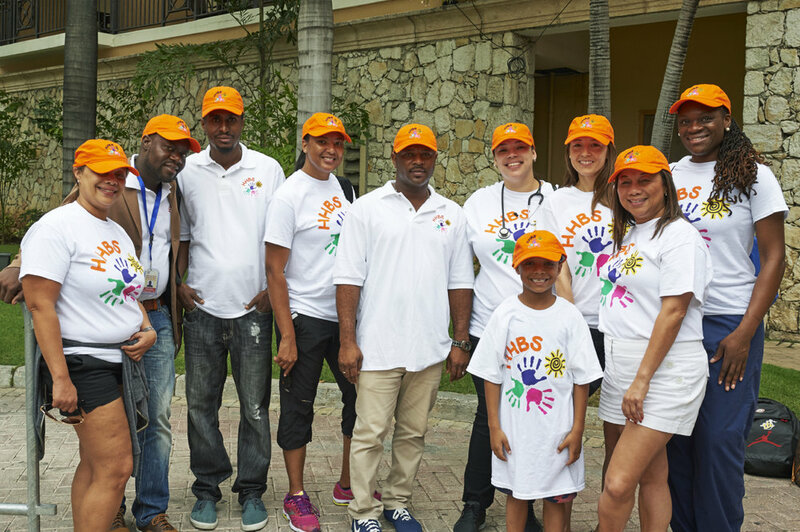 Upon arriving to the community, the children parents and residents were delighted to see the HHBS team once again. Before the distribution began the some of the children danced individually for the audience and sang. They were given bookbags after their performances. The remaining book bags were also given to some of the children. The major distribution began with the clothing and shoes in the order of children to adults. Distribution of food kits to the parents of the children followed. The kits contained tin-food, rice, beans, sardines or salmon, sugar, and oil. The excess of the food kits was left behind for the school. Over 60 school bags were distributed, 100+ Children Clothing package, 100+ adults clothing package, 400+ Food kits were distributed. The HHBS team members were individually given a token of appreciation from and the students and the teachers. The school family and the community members were overwhelmingly thankful for the donations and supplies. The debriefing was call to order by Fran. She expressed her gratitude to each ambassador. Fran also gave tokens of appreciation the local HHBS team members for their years of dedication and hard work. Each ambassador gave an account of their experience, observation, recommendations and opportunities for improving future mission trips. The team made a final assessment of the mission trip as they departed from Port-Au-Prince. The school community is dependent on HHBS for sustainability and growth. The school population has grown and has reached its maximum capacity. Students with different talents, abilities, and skills make up the school population. As a result, the teachers expressed their interest in expanding the curriculum to vocational skills such as arts and crafts. There is a need for higher grades or a continuation for students who graduate from the school. There was a surplus of food kits, but there was limited clothing, footwear, and stationary for the children who were the main target group. In addition, it was difficult to match the correct size to a recipient. The roof of the school is in need of repair. Many holes could be seen through the aluminum roof. Engagement with the residents during the health screening revealed that a significant number of individuals that were screened were unaware of the seriousness or potential risk factors of having a very high or low blood pressure and/or glucose reading. Many were unaware of ways to maintain normality of these vitals, and lack the financial resources or other means to access primary health care service for treatment for treatment or regular check-ups. For future missions, we recommend that HHBS keeps a data on all students enrolled at the school such as gender and age to reduce the possibility of a child being left out during distribution. Preliminary sorting of donations to be done before shipping to Haiti, to reduce the cost of shipping unnecessary items. Due to the high health illiteracy observed, future mission trips should include health education, and training of community leaders such as teachers how to conduct blood pressure reading, and understanding the results. This year’s mission trip was a phenomenal success! We saw our ambassador membership increase from four to eight! Our eight awesome ambassadors came together to carry out HHBS’s mission: to provide service to our brothers and sisters in the community of Croix Des Bouquets. Our youngest ambassador to date, Isaiah W. Walker, is 8 years old. Distribution Trip was a Success! Our 2017 Mission & Distribution Trip was a great success. Your generous donations helped distribute hundreds of Perishable Food Packs & School Packs (with school supplies) to the kids of the school and allowed our HHBS ambassadors to screen the adults in the communirty for high blood presssure and diabetes. From the bottom of our hearts - thank you for helping us feed a mind, one child at a time. Check out all the photos (by the talented Lisa Berg) on our Facebook Page! Helping Hands Bring Sunshine is entering its 7th year and we are so proud of what we have accomplished with your support, dedication and trust. On November 4, 2013, using generous donations from our supporters, we implemented a hot food program providing one hot meal a day to each student and teacher. What a great day it was for everyone! It reconfirmed to all of us that with your Helping Hands we can Bring Sunshine to all of the students and teachers. In addition to our distribution, the HHBS ambassadors will offer high blood pressure and diabetes screening for adults in the community. We will then celebrate the day with our annual HHBS lunch with the community! Please help us and contribute to our online fundraiser and help make our trip a success by sponsoring our distribution. We are very excited to announce the dates of our 2017 Mission Trip to Haiti / Port Au Prince! Please help us make our trip a success by sponsoring our distribution. On behalf of the kids of the school, Thank You! We are committed to making a difference in the lives of the people we touch. We continue to live by our approach of hand to hand distribution. Somethings as small as a pencil or a pen, sandals, blood pressure screening, toothpaste, toothbrush will bring smiles to their faces!!! The students, parents and teachers will be eternally grateful. Helping Hands need YOUR Helping Hands TODAY! Remember, your donation is Tax deductible. Thank you and may GOD bless you!